Osgood-Schlatter disease is a common cause of knee pain in growing adolescents. 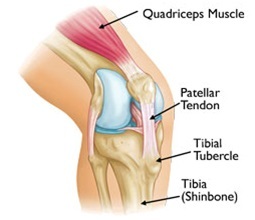 It is an inflammation of the area just below the knee where the tendon from the kneecap (patellar tendon) attaches to the shinbone (tibia). Osgood-Schlatter disease most often occurs during growth spurts, when bones, muscles, tendons, and other structures are changing rapidly. Because physical activity puts additional stress on bones and muscles, children who participate in athletics — especially running and jumping sports – are at an increased risk for this condition. However, less active adolescents may also experience this problem. Painful symptoms are often brought on by running, jumping, and other sports-related activities. In some cases, both knees have symptoms, although one knee may be worse than the other. Treatment for Osgood-Schlatter disease focuses on reducing pain and swelling. This typically requires limiting exercise activity Untill the patient can enjoy activity without discomfort or significant pain afterwards. In some cases, rest from activity is required for several months, followed by a strength conditioning program. However, if the patient does not have a large amount of pain or a limp, participation in sports may be safe to continue. Stretching exercises. Stretches for the front and back of the thigh (quadriceps and hamstring muscles) may help relieve pain and prevent the disease from returning.